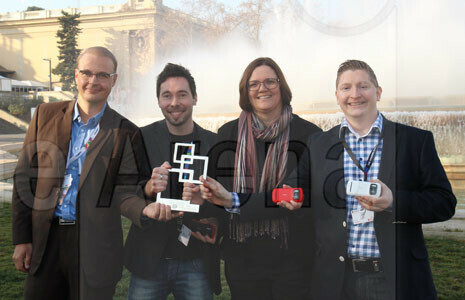 It's an award that recognizes novelty and things we haven't previously seen, rather than what's already out there, therefore it is not very surprising that Nokia 808 PureView won the Best New Mobile Handset award at Mobile World Congress 2012. Actually the whole title of the prestigious award is “Best New Mobile Handset, Device or Tablet at Mobile World Congress 2012″, which is even more encompassing. The decision is taken by a panel of analysts and journalists, which this year were no doubt impressed by the 41 Mpixels camera sensor the Finns R&D labs managed to cram into the Nokia 808 PureView's smartphone body. Nokia's Jo Harlow said “There’s lot more to come” at the presentation, and everyone started hoping we will see the PureView Pro camera tech in Nokia Windows Phones. Have a look at the winning team gathered for a family portrait in the photo on the right. 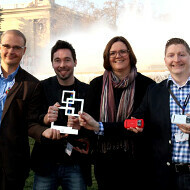 From left to right: the product manager Jussi Asikainen, co-inventor Juha Alakarhu, SVP of Smart Devices Jo Harlow, and co-inventor Eero Salmelin. congratulations to Nokia. the 808 41mp really came as a surprise. I hope the software doesn't disappoint. It's high time for Nokia to quit the phone business and start developing digital cameras. LOL. Pure view 808 is a waste of money. Ages old ARM11 Processor and a dated OS. What's the point of buying this chunky little device? It dosen't look premium at all. No where near the N8's design. If you want a good cam then buy a digital SLR. HTC One X deserves the title. Yeah, a good point and shoot camera with such a huge sensor would be a slap in the face to Olympus. Can you tell me in which way Nokia Belle FP1 (present on 808) is outdated ? Actually this OS is able to run smoothly on 1.3 GHz ARM11 processor, unlike Android which needs at least dualcore CPU. This just proves how well Symbian is optimized. Argument about buying DSLR is just ridiculous. Are you going to run around 24h/7d with DSLR around your neck ? 99% of people just want small pocketable device, with as good quality as possible - and this is exactly what Nokia 808 offers. Also, tell me a single reason why HTC One X should get a title ? Hauwei managed to do the same and it's obvious they are improving themselves at much faster rate than HTC. Thanks for your suggestions. We take a serious note of your suggestion. Now go take your pill ! HTC did not invent anything, they just put all the parts that were available together. This phone really deserve this award. Nokia made a new thing again with camera phones. look at the happy smiles of achievement on their faces! this shows how hard they worked for that..